Asus is amongst one of the companies that has established itself as one of the best makers of laptops. They have launched laptops that have just won the hearts of the people. Now Asus tries to make the same kind of impressions in the world of Tablets. Once more, Asus is not the only company that has their tablets flooding the electronic markets, there is fierce competition from all the other companies but Asus looks like they are heading the right way with their Eee Pad. 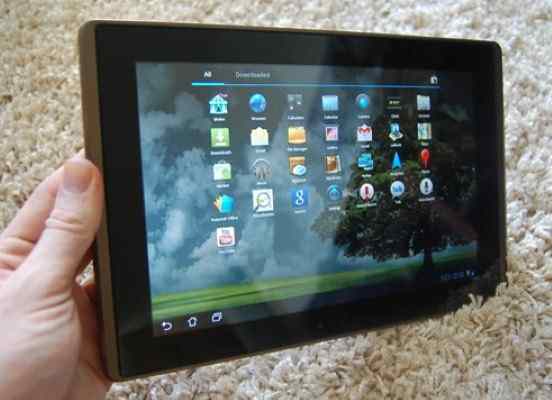 The Eee pad is being regarded as the thinnest tablet available in the market. This new generation asks for tablets that are light and thin. Asus have accomplished both these important qualities in their new Eee pad. With the launch of the I-pad 2, there was a big question amongst the people whether other companies will be able to produce something that is equally powerful and fun to use like the Apple’s new release the I-pad 2. Asus has divided its launch dates all over. People in England are the luckiest. They will be the first to get their hands on the ever so exhilarating device. The people would have to wait till January 2012. Asus will release only one version of the Eee Pad Transformer. This version will be equipped with a 32 GB memory, portable keyboard, charger, USB cables and the earphones. All this would cost around $499 which in comparison is quite expensive as compared to the previous model which was only 16 GB. What makes this tablet so special is that it is controlled with the powerful Nividia Tegra 3 processor. No doubt to make a tablet equally powerful as the I-Pad 2, they had to come up with a processor which is equally outstanding as the New I-Os 5. The Nividia Tegra 3 has accomplished new boundaries giving the new Eee pad with superb graphics and stunning performance. The Tablet is even equipped with the quad-core chip. This even adds to the praise of the stunning tablet. Working was never so fun. The new Tablet has made all types of work so much easier. Powered with the new Processor, the tablet makes work easier as now the tablet is quicker to perform tasks. The new processor has significantly increased its performance and now loading and uploading is quicker as compared to the previous models released by Asus. The Eee pad has the HD screen and it makes the colors come alive. With the added performance of the processor, and the HD screen makes gaming an all new experience. The pictures are so clear and bright that it is hard to believe that you are playing games on a tablet. The tablet has an 8mp camera. With all these added performances, it is important that the tablet has the battery to control all these functions. The Tablet is equipped with powerful rechargeable batteries. They can give a time up to 12 hours even while the tablet is being used for gamming. Himanshu is a technology blogger who writes about android, apple, ios, seo and is currently promoting iitjee reservation blog.